Pictured proudly sporting their toques blanches, the five lucky MTA – Mobile Travel Agents Advisors and their Banyan Tree Hotels & Resorts host, director of sales and marketing, Victoria Hobbs (second left) relaxing after cooking up a ‘veri-table’ storm of Thai dishes at Saffron, the Banyan Tree Bintan Island’s fine dining signature restaurant. 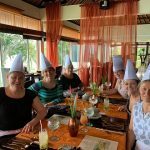 The MTA Advisors visit was part of an exclusive study tour including two-night stays at both the Banyan Tree Bintan Island and the Mandarin Oriental Singapore. Clockwise from left: Susan Anderson, Victoria Hobbs, Kyara Newport, Renee McLennan, Kim Newton and Sarah Day.